Today (Saturday, 10th December) sees Brownhills Christmas Market at Brownhills Methodist Church between 9am and 3pm. There will be festive music, children’s crafts and seasonal refreshments as well as a chance to pop into the chiurch and see the magnificent array of beautifully decorated Christmas trees. The excellent Kevin Simon has updated his post with lots of photos of the Christmas Tree Festival, too. Saturday also sees the Brownhills Community Association Open Day and Christmas Fair at Brownhills Activity Centre (The old Central Boy’s School on Pelsall Road by the main island, opposite the Parkview Centre) between 10.30am and 4pm. Enjoy the craft stalls, bouncy castle, Santa’s grotto and carols from Spotlight Youth Productions. 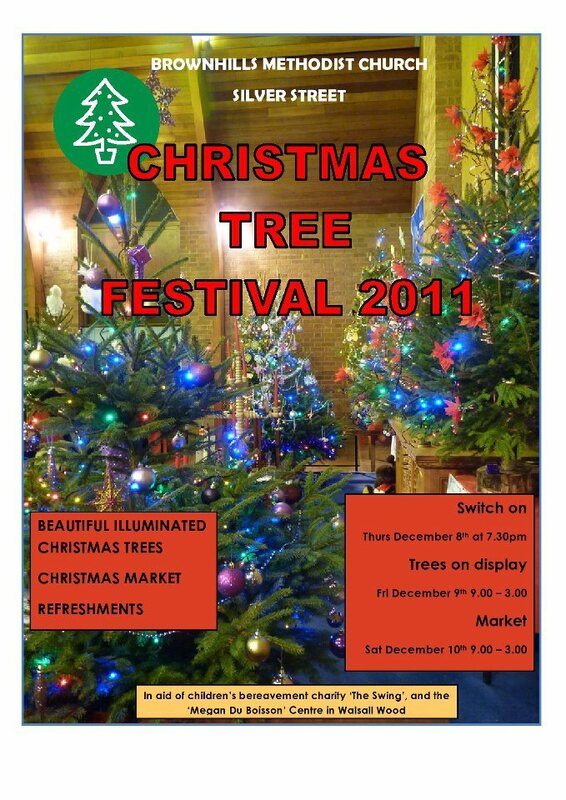 This entry was posted in Brownhills stuff, Churches, Events, Followups, Fun stuff to see and do, Interesting photos, Local Blogs, Local media, News, Shared media, Social Media, Spotted whilst browsing the web, Walsall community and tagged activities centre, Brownhills, Brownhills Christmas Tree Festival, Brownhills community association, Christmas fayre, Christmas Magic in Brownhills, Christmas Market, Events, Facebook, Festive, festivities, local blogs, Methodist Church, New Photos, Silver Street. Bookmark the permalink. 4 Responses to Two Christmas events today in Brownhills! Have a Brownhills bobby bobby Christmas and a bobby new year Brownhills Bob, best wishes, the house which never used to be so mad! Off topic, but why is the Megan Du Boison so called? Megan du Boisson was a campaigner (1960s ?) trying to improve the financial circumstances of disabled people. I think the idea was to get disabled people to speak up for themselves and demand asssitance. Among other things this led to the attendance allowance, which lots of people benefit from today. It covered the cost of home care visits for my old Dad a couple of years back and I guess this is when most people find out about it.